As anyone who's got a pet knows, cleaning up after them is just part of the package. I bought some industrial-strength carpet cleaner from Target, and have gleefully used it to deal with those pesky stains. But what about the stains you can't see ? For those cases, you can pick up a $6.99 UV Stain Detector. 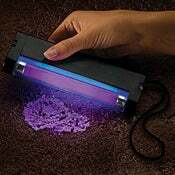 Shine it over your carpet, and the stealthy stains invisible to your naked eye will glow in all of their unholy glory. It runs on four AA batteries that you'll have to supply yourself, and also features a flashlight and includes a stain removal guide. Sure, it sounds like a good idea, but I have to ask the question that your average guy is going to ask: why do I want to spend my time cleaning stains that nobody can see? You, my friend, are missing the side bonus: it's the perfect gizmo for playing CSI.